Advantages Of Gabion Cages – Gabions have been used for centuries. They are large cages made from steel wire either constructed using weld mesh or woven wire. Weld mesh gabions have become more popular in recent time for retaining applications where installers and consumers gain installation efficiency, increased life cycle and aesthetic value. The Urban Kubez gabions are produced with quality Australian made weld mesh steel for these reasons. Gabion walls require limited footing preparation. They can be linked together in modular fashion creating 1 continuous strong structure. This linked configuration, once gabions are filled with rock, becomes very heavy and robust. The characteristics make gabions the optimum choice where soil stabilisation and erosion control are primary factors. The weight and form of gabion walls will resists pressures of shifting soil and water flow where other retaining system fail. In addition to their stability advantages of gabion cage retaining walls include flexibility to shift with ground earth without cracking, splitting or loosing integrity. Quality weld mesh gabions such as the Urban Kubez meets Australian and International standards for gabion structures. Retaining walls that are constructed of concrete, timber, blocks etc will over time suffer from hydro-static pressure (water build behind the wall). Hydro-static pressure is common among standard retaining walls and is the common cause of failure within a short period of time unless significant cost and effort is made to design special footings and drainage systems. Gabions do not suffer from the same problem, rather, water simply runs straight through the rock fill dissipating quickly. Over time small particles of soil will find their way into the gabion where propogation of small plants will occur rooting-in effectively creating a natural green wall and stabilising the gabion structure even further. 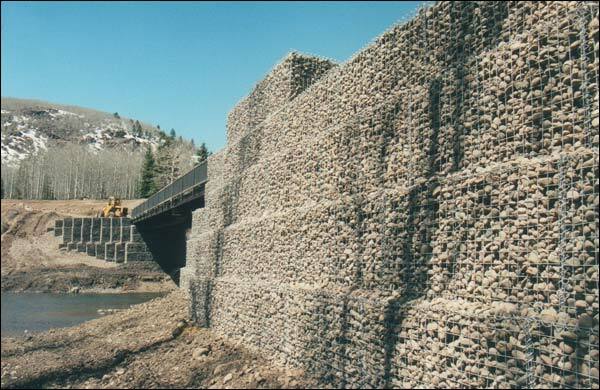 Depending on the application gabions are available in many size congurations. Generally for civil projects woven gabion baskets are utilised in either traditional boxes or alternatively low profile mattresses. There are many advantages of gabion cages to consider when comparing against other systems on the market. Despite whether your installing a small gabion rock wall at home or a civil contractor installing a mega structure the advantages remain the same. Gabion walls can be installed by construction contractors, landscapers or DIY .